Next May’s European Parliament election is likely to be haunted by Europe’s inner demons, from the clash with Italy’s populist government over its budget to the xenophobic front that has formed in the Visegrád countries. The crisis of the traditional centrist parties, which have been essential to building and maintaining consensus in the European Union — even as they have struggled to implement needed reforms — is also far from resolved. But if, as current indicators suggest, Europe is facing an economic slowdown, the pre-election discourse could change significantly. Until a few months ago, the prevailing narrative was that the economic crisis was over, even for the hard-hit countries of the Eurozone’s periphery. As a result, Europeans had shifted their attention to other issues, such as refugees and security, that were threatening political stability and eroding consensus for the European project. But GDP growth in the Eurozone has been slowing since its peak in the third and fourth quarters of 2017. The persistent weakening of the Eurozone economy — even in Germany, GDP contracted in the third quarter of 2018 — does not bode well for the EU, which could be facing twin political and economic crises. The obvious question is why the Eurozone recovery is waning, even amid highly supportive expansionary monetary policies. In fact, if growth has really peaked, it would imply that the Eurozone’s potential growth rate is about 1 per cent. This rate of potential output growth — roughly half the pre-crisis trend — is associated with an aggregate unemployment rate of about 8 per cent. The Eurozone’s flagging growth reflects old and new structural problems, the legacy of the last crisis (which still weighs on banks’ asset quality), high debt levels in some countries, and external shocks that have affected demand. In other words, Europe faces challenges to its potential growth, as well as negative cyclical forces. 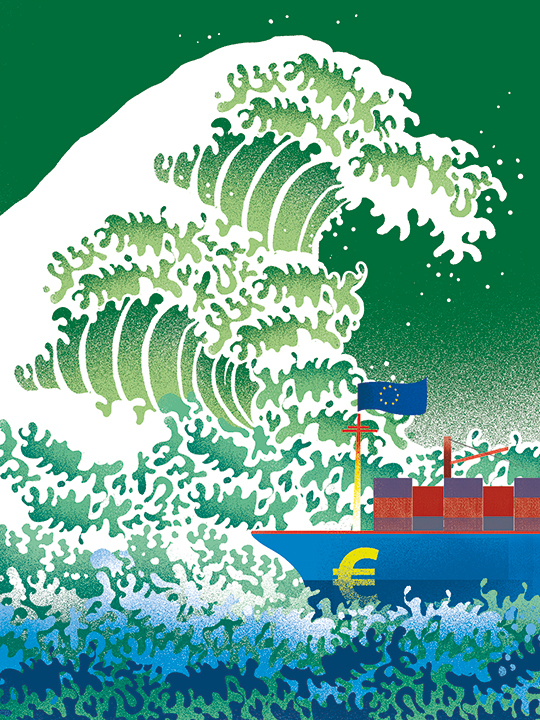 The latter, in particular, call for an aggressive response — not least because, if the Eurozone economy were to enter a recession in the near future, it would have limited policy tools with which to counter it. While Europe has better crisis-management tools than it did when the last recession hit in 2011, they remain incomplete. Moreover, the European Central Bank will have less space to use monetary policy to kick-start the economy: interest rates are already at zero, and a new asset-purchase programme would inevitably be controversial. Fiscal policy is in a similarly weak position. Of course, it is critical to avoid repeating the mistake that was made in 2009, when EU leaders embraced rapid fiscal consolidation before the recovery had gained its legs. But, to counter the cyclical slowdown, more stimulus would be needed. Yet a new recession would cause financial markets to become even more deeply divided along national lines, while strengthening the correlation between sovereign and bank risk. Many countries would have limited scope for counter-cyclical fiscal policy, either because of the EU’s rules on public debt or because market tolerance for public debt is lower in a monetary union, as has become apparent since 2010. Furthermore, given the lack of any common fiscal capacity, there is no institution or mechanism that can apply fiscal stimulus to the Eurozone as a whole. Reforms that would address this cannot be expected in the next few months. Normally, if a country’s fiscal capacity is weakened, it could respond by coordinating monetary and fiscal policy. For that to work in the Eurozone, member countries must all work together. Indeed, they should agree on a common policy stance at one of the myriad formal and informal meetings of Eurozone heads of state and finance ministers. This would not leave markets fully reassured, because it is unlikely that an agreement would include an unlimited joint guarantee of new debt issued by already-indebted countries. But it would demonstrate that Eurozone countries recognise the importance of policy coordination, whether fiscal consolidation during good times or counter-cyclical fiscal policy during bad times to minimise the chances of a debt crisis in the monetary union’s weaker economies. More fundamentally, such coordination would go some way toward rebuilding mutual trust, which has been sorely lacking in Europe. This could amount to a powerful refutation of the tactic, adopted by countries like Italy, of aggressively confronting the EU authorities. As voters throughout the EU head to the polls in May, such a message could be a game changer. Lucrezia Reichlin is Professor of Economics at the London Business School.